Offering true multi-crop baling the F441M is ideal for medium volume use or for low volume operations where a narrow timeframe means high capacity and speed are essential. Packed full of features it’s a high value package that will perform reliably, year after year. There’s a choice of MultiCrop or Silage Special. 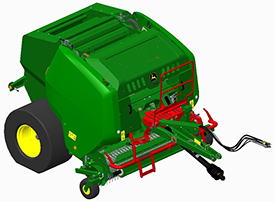 This baler provides versatility to small and medium farms because of its ability to harvest wet and dry crops. Due to the slats conveyor integrated in to the tailgate, the MultiCrop gate efficiently grabs dry crops. Even in hot brittle barley straw, bales are constantly rotating from the beginning of the process to the tying process. Combined with a front chamber featuring powered 12 ribbed rolls, the F441M MultiCrop provides high fixed chamber baler versatility. Steel-on-steel contact, creating traditional conveyor noise. The MultiCrop tailgate decreases noise by having rubber conveyor tracks that absorb most of the noise and vibration. Increasing the number of chains is often linked to high maintenance and reduced lifetime. The MultiCrop gate has two idlers that optimize chain tension to enhance chain lifespan. 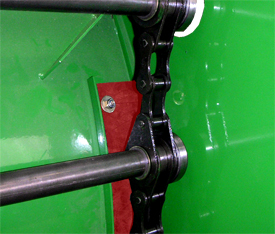 An aperture on each tailgate side allows the operator to check and replace slat bearings. 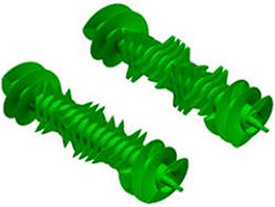 Due to heavy-duty slats (35-mm [1.4-in.] diameter), the bending of parts is rare and the apertures can be replaced without dismounting the conveyor. The F441M Baler provides operators with a single baler to harvest all kinds of crops, from gliding straw to short, sticky silage. Cam-track technology provides an efficient solution for such needs. 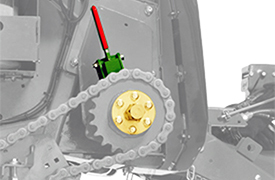 The traditional stripper design provides reduced space between the pickup tines and rotor feeder, while the tine motion helps to avoids pinching. 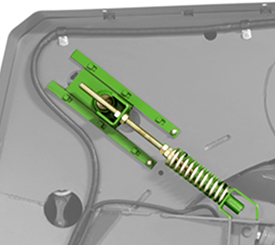 The cam-less technology requires long strippers, creating a dead-zone between the tines and rotor. Additionally, fixed tines can easily pinch crops in sticky conditions, causing plugs that need to be manually removed. The F441M Balers feature a 2.0- or 2.2-m (6.5- or 7.2-ft) pickup and galvanized strippers for an extended lifespan. The four-tine bars mounted on sealed ball bearings and equipped with 5-mm (0.2-in.) diameter tines meet the picking capacity expected by small and medium size farms. The F441M is available without a precutter (Rotoflow HC feeder). MaxiCut HC 13 knives is proposed as alternative solution for operators searching for a regular precutter with 80-mm (3-in.) space between knives. 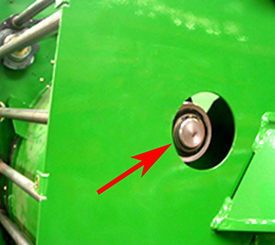 In order to provide quality cutting, knives are individually secured by springs to protect against foreign objects and are controlled by a hydraulic valve conveniently located on the front of the baler. As with the F440M, the drop floor makes removing plugs easy, even those under converging augers. 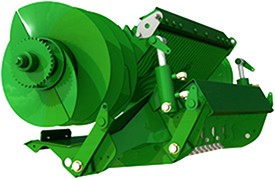 This exclusive design covers the rotor width, so wherever a plug occurs, the unplugging device decompresses the crops and feeds the plug into the baler. Parallel kinematics provides a consistent 40-mm (1.6-in.) space on the entire drop floor, eliminating narrow pinch points like front-hinged drop floors have. The drop floor is easily controlled by a hydraulic valve located on the control panel. The drop floor is standard for the F441M, when equipped with the MaxiCut HC 13. 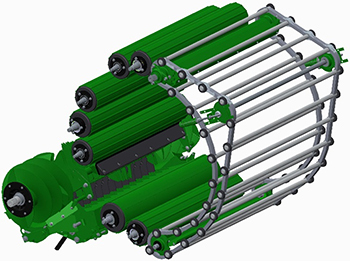 For a Rotoflow HC equipped baler, the drop floor system is proposed as an option. 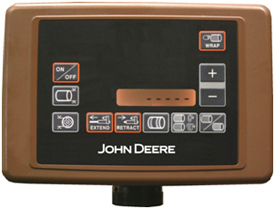 Even without this system, the F441M can be unplugged without the operator reaching their hands into the pickup. If this happens, the operator needs to declutch the rotor, put the wrench on the rotor, and reverse to remove the compressed crops. As a member of BaleTrak system range, the BaleTrak Easy offers expected reliability, allowing longer lifetime. 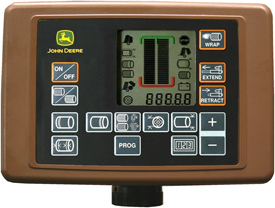 Full icon description, such as gate status, tying mode, tying status, bale status, battery status, stop alarm. Even with long net rolls, a roll is changed at least twice a day. Operators lifting 40-kg (88-lb) rolls over 2.0-m (6.6-ft) can cause serious injury. A convenient loading ramp allows the operator to easily push the heavy net rolls to the wrapping system and to the roll storage device. When equipped with net wrapping, the F441M Baler has one roll installed in the device and one roll, up to 300-mm (11.81-in.) diameter, in the storage. An additional box is available as an option. The additional box is delivered as standard with the net and twine option. Once placed in the wrapping device, the net is easy to install. 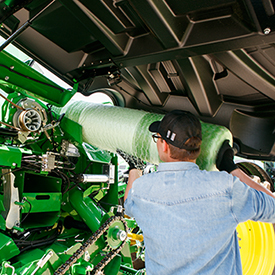 Declutch the net system and push the net between the feeding rolls. Re-engage the system and close the shielding. The process is completed in less than a minute. A convenient loading platform accessible from both sides of the machines allows the operator to easily put in place the roll and setup the bale tying system. Depending on the chosen monitor, any wrapping issues can be communicated by the display.